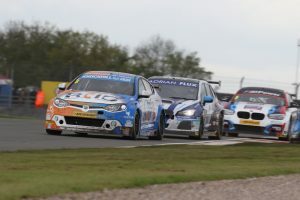 The AmD with AutoAid/RCIB Insurance Racing team secured a brace of points scoring finishes from a challenging second weekend of the Dunlop MSA British Touring Car Championship season at Donington Park. 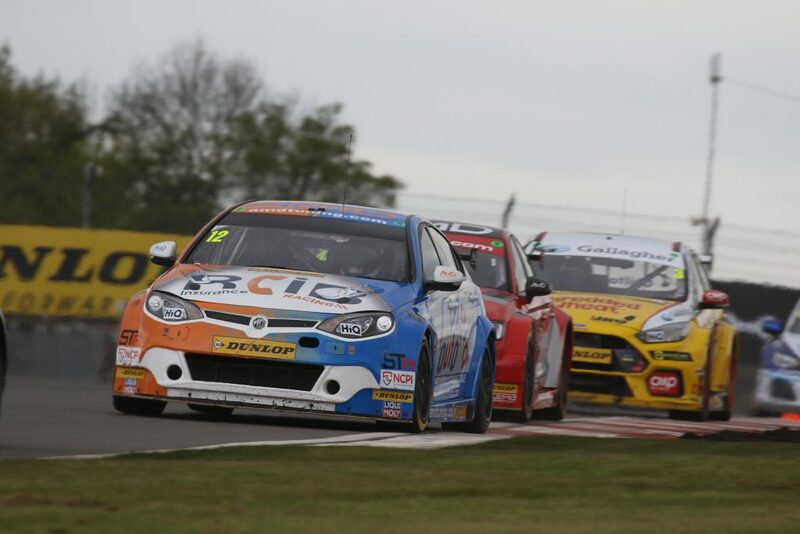 The West Thurrock-based team headed for the East Midlands circuit hoping to build on the impressive results gained in the season opener at Brands Hatch, where drivers Tom Boardman and Rory Butcher were able to challenge well inside the top ten in their MG6 GTs. Lancashire racer Tom qualified in 29th place for the opening race of the weekend leaving him with work to do when the lights went out, but the former race winner showed his pace with a battling drive through the field to finish in 16th spot – just half a second away from the points scoring positions. Running the less favourable hard compound tyre, Tom then faced an added challenge in the second race but once again finished just outside the points in 17th, with the impact of the tyres being seen in the fact that his fastest lap was six tenths of a second slower than he had managed on the prime tyre in race one. Back on the regular tyre for race three, Tom was optimistic about picking up some points and survived a chaotic opening lap to run inside the top 15. Unfortunately his chance of scoring points was ended on the eleventh lap when contact from Jake Hill’s VW saw him go off into the gravel at Coppice to bring his race to an early conclusion. Tom ends the weekend 23rd overall in the standings and 13th in the Independents title race. Team-mate Rory had started the opening race from 19th on the grid despite being little more than a second away from pole in the tightly-fought field, and he would spend the entire race battling for a position in the points. Holding 16th going into the final lap, the Fife racer made a move around the outside of Rob Austin’s Alfa Romeo into the Old Hairpin but was run wide on the exit of the corner and slipped back to 22nd place. A stunning opening lap in race two saw Rory make up eight places to run inside the points and he would continue to go forwards as the race wore on, taking the finish in ninth spot and earning pole position thanks to the reverse grid draw. Initially holding the lead when the lights went out, Rory slipped back to third by the end of the opening lap but continued to run well inside the top ten after an early Safety Car period despite being on the less favourable tyre. Having been forced out wide on lap nine, Rory found himself dropping towards the lower end of the top ten and he would eventually take the flag in 13th spot. Rory ends the weekend just outside the top ten in the championship standings and seventh in the Independents’ standings, whilst he is now just one point away from the Jack Sears Trophy lead. “I couldn’t get the car working in the slippery conditions in qualifying and it meant we were out of position going in to race day. We made some changes overnight and the car felt a lot better, so we were able to make good progress in the opening race. “On the hard tyre in race two, it was a case of doing what we could as we struggled for front end grip but I felt we could have scored points in race three. Sadly, Jake Hill decided to put me off into the gravel, which is a shame. “After qualifying and race one, it would have been easy to let my head drop but this weekend has really shown me you should always look on the bright side as you never know what is to come. “For some reason, we struggled to get the car working in qualifying after showing well in practice and that meant we were on the back foot ahead of race one but we could have scored without the incident with Rob. It was just one of those things where he was trying to pass the driver ahead and I don’t think he realised I was trying to make a move on the outside and ran me wide. “The aim in race two was just to try and score some points, so to get into P9 exceeded my expectations considering where we started – although it showed how strong the pace in the car was. “It’s been another good weekend for us as a team, even if we weren’t able to match the highs of Brands Hatch a few weeks ago. Qualifying didn’t quite go to plan, which left us on the back foot going into Sunday, but the guys knuckled down and fought back well. “Both Rory and Tom have shown good pace throughout race day and it was only through bad luck on Tom’s part in the final race that they haven’t both come away from the weekend with some points on the board. “As at Brands Hatch, there is plenty we have been able to learn this weekend that will benefit us as we go forwards and hopefully we can challenge for points at Thruxton next time out.